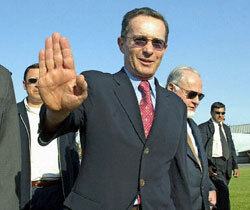 Colombian President Álvaro Uribe arrives in Chile, Dec. 8, 2003 (Photo: Victor Rojas/AFP-Getty Images). The abrupt resignation under political fire in early November of a top Cabinet officer in President Álvaro Uribe’s administration marks the latest in a series of embarrassing political gaffes and miscalculations that threaten to erode Uribe’s previously solid base of support. The forced departure of Interior and Justice Minister Fernando Londoño Hoyos came less than two days after he infuriated legislators from the president’s own Conservative Party by issuing a bald threat—swiftly disavowed by Uribe—that the president would resign just 15 months into his term and call new national elections if Congress failed to approve his controversial agenda for fiscal and anti-corruption reforms. “The warning that the government would contemplate a violation of the constitutional order if the party were to withdraw its support for President Uribe is as disconcerting as it is unacceptable,” commented El Tiempo in an editorial (Nov. 5). In the wake of this failed attempt at “poorly disguised blackmail,” the editorial observed, Uribe must come forward to openly address the nation’s growing unease over his government’s policy directions. This follows opposition victories in Bogotá and other key mayoral elections and the defeat of a national referendum held in late October on Uribe’s ambitious reform program.